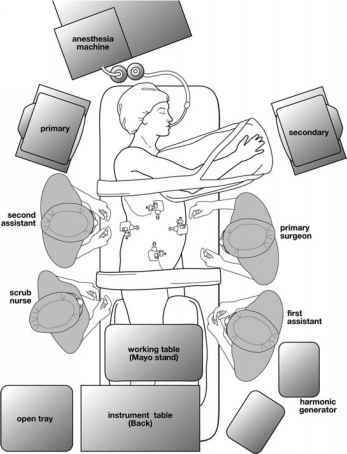 FIGURE 1 ■ Suggested operating room setup for laparoscopic transperitoneal cryoablation. We have a low threshold to use an open Hasson cannula technique for the abdomens with a history of previous surgery and if complicated adhesions are anticipated (Fig. 3). to the abdomen using an optiview system for the camera, depending on the surgeon's choice of using 5- or 10-mm telescope. A second 10-mm port is placed at the lateral margin of the umbilicus and the third port is placed in a subcostal position, just lateral to midline, halfway between the xiphoid and the umbilicus. The second and third ports could be 5 or 10 mm depending the side of the lesion and the dominant hand of the surgeon. An additional 5-mm port may be necessary on the right side to retract the inferior margin of the liver, about two fingerbreadths below the costal margin in the mid-axillary line. FIGURE2 ■ Patient's positioning for laparoscopic transperitoneal cryoablation. FIGURE 3 ■ Trocar placement for transperi-toneal approach. FIGURE4 ■ Trocar placement for retroperitoneal approach. (A) Place 3 trocars lateral to the erector spinae muscle just below the 12th rib, (B) three fingerbreadths above the iliac crest in the anterior axillary line. We found it is not necessary to use a balloon for formal dilatation of the retroperitoneal space, as we have not needed that much working space for renal cryoablation. Intrarenal lesions need intraoperative ultrasound to locate the lesions and exclude multicentric lesions. The open Hasson canula technique is routinely used. A horizontal 2-cm incision is placed 1 cm below and lateral to the tip of the twelfth rib. Then the latissimus dorsi muscle fibers are bluntly separated and retroperitoneum entered by opening the anterior lamella of the thoracolumbar fascia. Blunt finger dissection is performed to develop space by pushing the peritoneum away from the psoas major muscle. We found it is not necessary to use a balloon for formal dilatation of the retroperitoneal space, as we have not needed that much working space for renal cryoablation. Alternatively, a trocar mounted balloona could be used to develop adequate working space by instilling 800 to 1000 cc as described by Gill and his associates. A 10-mm blunt tip trocara is placed after removing the balloon dissection device and it is secured by inflating the internal retention balloon and cinching external foam cuff. 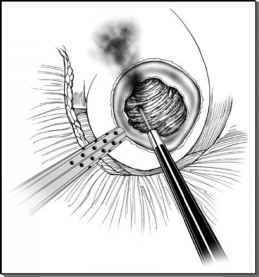 A Hassan cannula could also be used and it is tightly fixed by using fascial sutures around the trocar. Two more secondary ports are placed under vision, one 5-mm trocar is placed three fingerbreadths above the iliac crest in the anterior axillary line and the other 5-mm trocar is placed lateral to the erector spinae muscle just below the twelfth rib (Fig. 4A and B). The camera is inserted via the lower quadrant port and the surgeon operates with the subcostal and periumbilical ports in the transperitoneal approach. The Harmonic scalpel™ a is typically used to incise the line of Toldt and for subsequent exposure of the renal mass through the Gerota's fascia. Intrarenal lesions need intraoperative ultrasound to locate the lesions and exclude multicentric lesions. Ultrasound can also assess for other lesions in the remainder of the kidney. Extensive mobilization of colon, spleen, ureter, and hilum is not necessary. 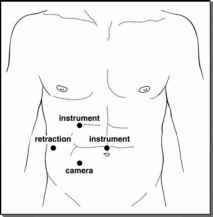 In the retroperitoneal approach, the camera is inserted via the middle port and surgeon operating through the medial and lateral ports. Maintaining the orientation and identifying the psoas major muscle are very important in this approach. We routinely use laparoscopic ultrasound to help localize the renal mass and Gerota's fascia is incised and the renal mass is dissected by opening the perinephric fat. Once the renal lesion is identified and well exposed, the cryoablation technique is similar in both approaches. After finishing the procedure, hemostasis should be checked by lowering the pnuemoperitoneum to 5 mmHg and the larger abdominal ports are closed using a port closure device. We perform a simple closure of retroperitoneal ports.